When you are out and about do you run into plants that are visually familiar but you do not know their name? We end up giving them a nic name. This tall spikey plant is known as Nasty Sucker. 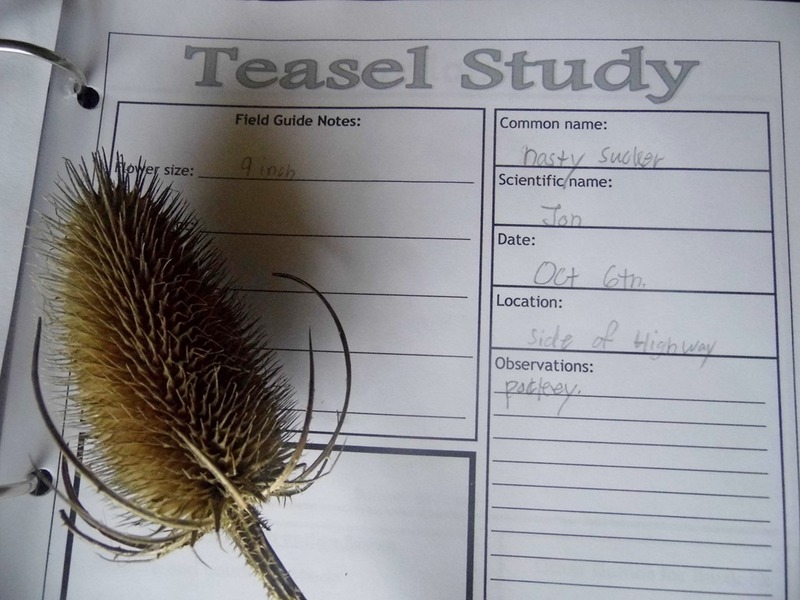 This month we got to learn it’s name – Teasel. Jon wrote an note to Cows. “Cows” You can’t eat. Very Painful. Hurts very much to grab. Just Don’t Grab. Very sharp and Prickly with its thorn like stem. Not very appealing to look at. Smells not very good, but not very bad. – The Nasty Sucker. 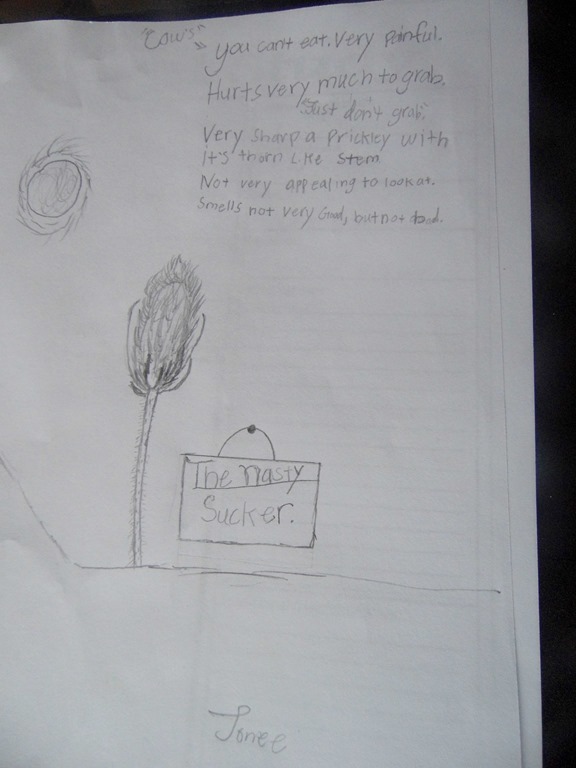 His notebooking may not be very impressive – but his interest and curiosity is. 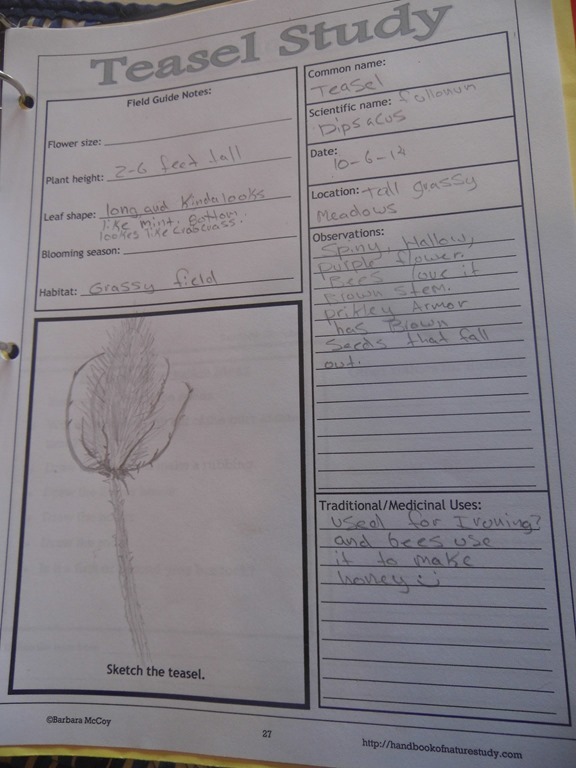 He enjoyed all of the videos linked to the challenge and he was the one that found and picked the Teasel. I have yet to find it this month. He was walking from the Surf Shop to church one evening and found it on the side of the highway. Huge smile and grin, he gave it to me as if it were a dozen red roses when he walked in the door. He remembered the rosette base and that it looked more like a bush, when he expected a single long teasel flower. He got out the microscope to look at the seeds, stems and flower. It was interesting to see that the thorns on the stem were hollow. Really cool to look at! On the other hand, our other student – a friend – was more interested in the academic side of learning. He was happy to look at the Handbook of Nature Study, answer the questions, watch the videos and complete the challenge. Not a lot of observation – or desire to go and find one. He was not interested in the microscope, but he really enjoyed drawing the specimen and put a lot of effort into the study itself. Two different boys, two different ways. Both – on their own – did the study without coercion – willingly. Both – will forever remember the name – Teasel, that Nasty lil Sucker. Speaking of drawing – we are also enjoying our 11th grade Art and Music Study from Harmony Fine Arts. The results of the study have been quick! The boys were watching the very educational flick – Wild Kangaroo Street Fighting – when our friend T came in and excitedly told me the background music was from his music lesson last week. I love it when the boys hear music and know who wrote it! 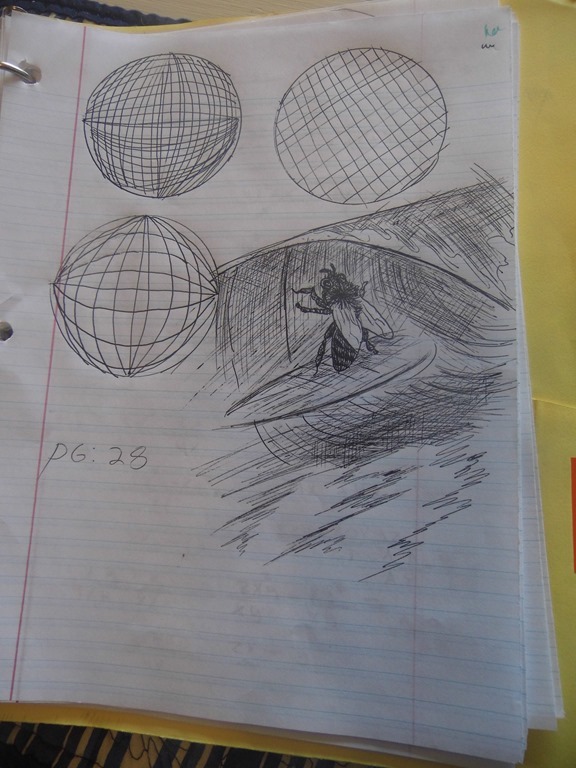 They are enjoying the pen and ink portion of the Art Study – Page 28 found the fly on a surfboard. Giggle. Come join us at the Outdoor Hour Challenges at the Handbook Of Nature Study.Com! P.S. 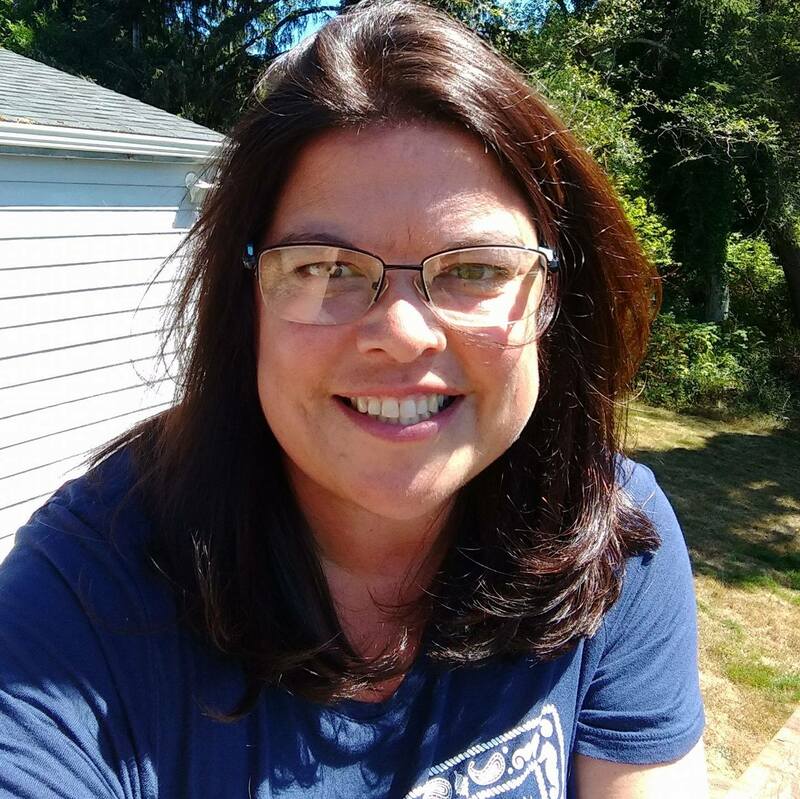 – After hitting publish, I ran off to the Dentist. On the way home, I drove by several areas that had Teasel!! Well – At least we’ll know where to find it! 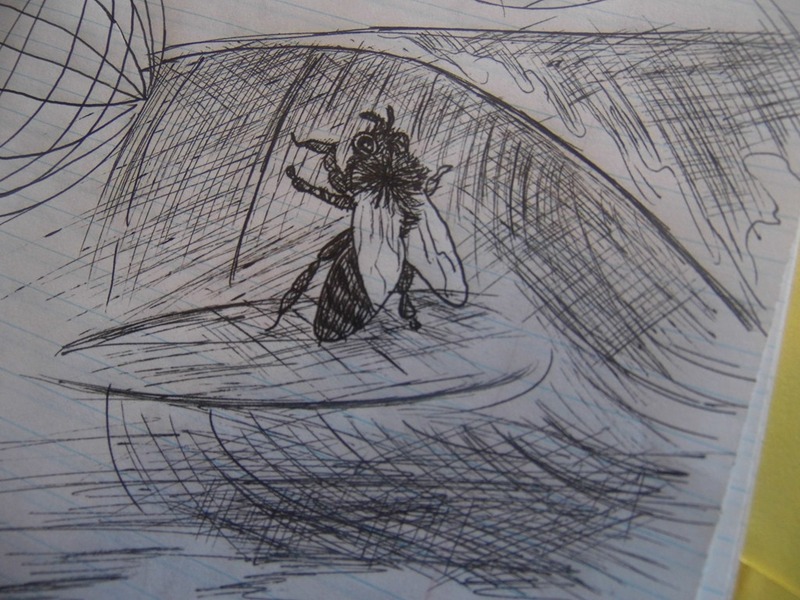 This entry was posted in Outoor Hour Challenge, Some Schooling and tagged Art, Charlotte Mason, harmonyartmom, harmonyfinearts, High School, HSBlogger, Music, Nature, Notebooking, Outdoorhourchallenge. Bookmark the permalink. This made me smile! Both that your son found and identified AND that you allow for differences in style and learning with both boys. 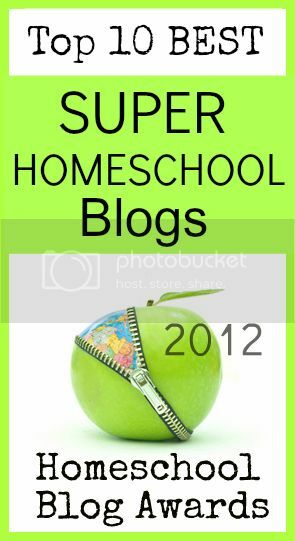 Thanks so much for sharing your study and observations with the OHC Blog Carnival.